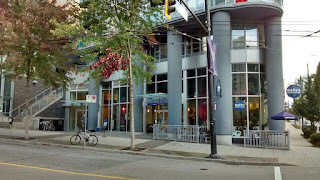 This morning I ventured down Robson Street to Waves Coffee (211 Robson Street, Vancouver) a location of a Vancouver area coffee chain. This location is on a ground floor of a modern condominium building a couple blocks up Robson Street from BC Place. The cafe features large windows and high ceilings to allow lots of sunlight in. It was a pretty quiet 9:30 a.m. visit for us as there was only a few university or college students enjoying the free Wifi along with a few tourists enjoying their morning brews while studying their maps. I ventured to the counter and ordered. The Order: 1 Medium Black Coffee, medium blend. The two friendly employees behind the counter worked as a team to quickly pour the coffee and collect payment of $2.20 (taxes included) from me. I ventured over to a table to enjoy my coffee and catch up on my e-mail. I connected to the free Wifi but had forgotten to write the free wifi connections password. I returned to the cash and copied it down. Back at my table I settled in with a few sips of the coffee. A pretty smooth medium blend that I actually believe is better than Tim Hortons Original Roast they've been perfecting for fifty plus years. A fresh smooth blend that has a slight hint of chocolate taste. Size wise the coffee is about the same size as a Tim Hortons medium cup but a little more pricier. 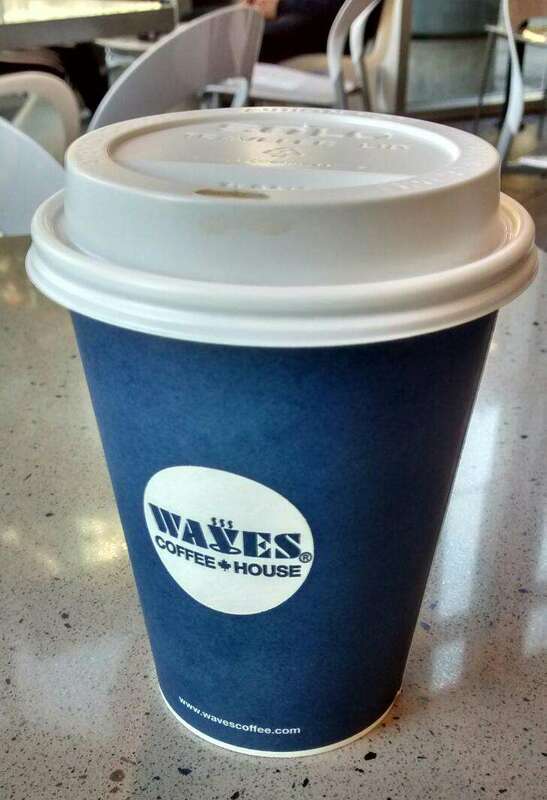 It really comes down a better fresher tasting cup of coffee for a slightly higher price at Waves vs the regular Tim Hortons. Overall, the service is friendly and fast. This location has lots of seating to both people watch out the window or have a quiet conversation with others over a fresh brew along with perhaps a baked item or two. If I was living in this area on a regular basis, I'd be sure to stop by on a regular basis.